Mac computers have long had the reputation of being more reliable and secure than PC’s mainly because the system they run called Mac OS –Mac Operating System (written in Unix) is very different from that of say, Microsoft Windows. Whereas some systems like Windows has many automated tasks including updates, Apple’s system requires the user to give permission often via a password for any changes to the system. In recent times threats to computer systems have changed and the OS needs to be updated to avoid their security being compromised. 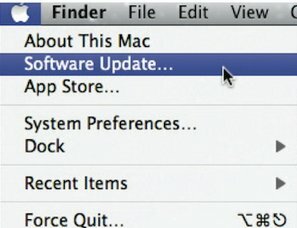 A recent survey by security company DUO revealed that out of 73,000 Mac computers operating in the real world 4.2 percent of them were not running the firmware they should have been based on their operating system. Firmware is the core system that runs when you first turn on the machine to check all is in order. Malicious code can get into your system if the firmware is not updated regularly. One such attack on the OS system called Thunderstrike used a weakness in the firmware to allow hackers to control machines remotely. Apple is aware of such issues and regularly release updates to their system but users are not installing the updates. It’s absolutely vital to keep your Mac system updated to avoid serious problems. The latest firmware version is called OS 10.12.6 and you can check what you’re running from the Apple menu at the top of your screen and selecting About this Mac. It’s simple to update, just click Software Update from the same menu. Software updates from Apple are free.